I was struck by this article in the Independent yesterday which outlined some of the top food trends for 2015. Being a) greedy and b) fond of new things I really should be part of the target market for this kind of thing. Here’s the link if you’re interested. But… I’m not, really. Don’t get me wrong, this stuff is mega interesting to me. But the purported health benefits are things I put up there with “detoxing” and “superfoods”. I have strong views on chia seeds (nature’s tapioca, except £5 per tiny bag?! Larceny!! ), chlorophyll (do not get me started) and basically all forms of diet jiggery-pokery which include the fashion for everything to be gluten-free. This time last year my sister went on some super-trendy Kensington-endorsed supervised diet and exercise regime and snarfled liquid green goo, endless amounts of smoked salmon and eggs followed by glorified protein shakes at £40 per packet while claiming that humans “weren’t evolved to eat gluten” (grrr….). And she lost a load of weight, which frankly given the alarming cost of the whole exercise was a relief but no surprise really, if you stop eating crap and exercise like billy-o. Now I’m the first to admit that I definitely need to eat better (and less) and move more. But unless you’re a coeliac the idea that you’re going to die from eating carbs is a bit moronic (other opinions available all over the internet and some for many of your lovely english pounds). But back to the subject, the article is an interesting read, and it will be kind of fun to see whether any of it comes to fruition. Let’s take a closer look, shall we? Until about three weeks ago you’d have got a blank look from me. Vermouth in my world is something posh people put in fish soup. However, completely by accident I appear to be riding the crest of this trend, having ended up in Soho’s Mele e Pere after an abortive attempt to go to Mark’s Bar at Hix (I queue for many things in my life, but a stiff drink shouldn’t be one of them). Myself and the Lovely One enjoyed a couple of very nice cocktails. They were… fine. A nice bittery but very very sweet strawberry confection and a fabulous tart apple job. The food looked great. Eh, what can I say? It didn’t set my world on fire. Judging by the description this is some sort of magical additive powder and is described as being set to “oust chia” in the superfood stakes. Hence my suspicion is set to “nuclear alert” levels and I’ll pop it in the “likely nutritional woo woo” section of my imaginary supermarket. Magic tree water available for only 2 months of the year? Why yes, marketing wizard, I will freely hand over my credit card. Or not. trend-o-meter – 1/5 (the next coconut water? Please jog on). Given that I’m the sort of credulous fool who is still wowed by the little smartphonesque order things they have in Wagamama this should be right up my street. And in principle, it sounds like a good thing (less staff = lower service charge, right?). But I worry that less scrupulous restaurants will keep the service charge, fire the staff, and hike costs another way. So, techno lover me says yes. Miserable lefty says BEWARE. trend-o-meter – 3/5 (sounds good. I’d like to try it if I can be sure of the safety of my karma). *This reminds me of the time that a friend told me that prawns were “insects of the sea” and I was horribly upset about this and couldn’t eat them for a while. What a bloody idiot I am sometimes. Delicious every time I’ve tried it, sustainable, available in the UK without silly amounts of food miles – it’s a winner! But consider wakame (used in sushi making) and laver bread and this feels like a bit of old news. trend-o-meter – 4/5 (top marks with a point deducted for not actually sounding that trendy to me). I love bitter flavours. In Malaysia I ate bitter gourd in stir fries on a regular basis and found it completely scrummy every time. And one of my key discoveries of 2014 was the joy that is pomegranate molasses. I’ll have to post the recipe sometime but essentially it makes the world’s best aubergine salad and is helpfully also amazing on just about everything. Vivat Sally Butcher’s blog and books for introducing me to the concept. The woman can do no wrong (I can, however, having parlously failed to visit her shop despite it being on my List of Things Which I Must Do). 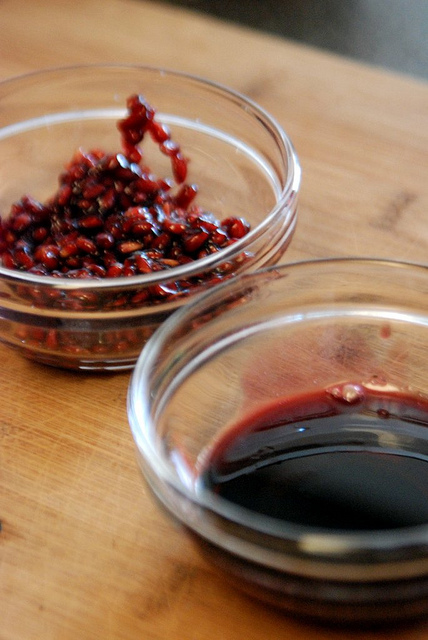 trend-o-meter – 5/5 (drop everything, leave the house and find a bottle of pomegranate molasses). 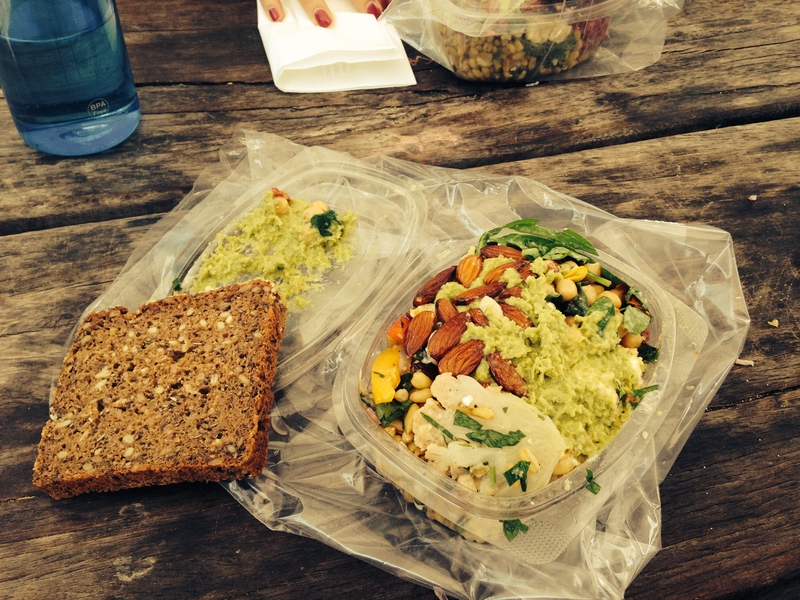 Delicious salad from the Copenhagen Torvehallerne. 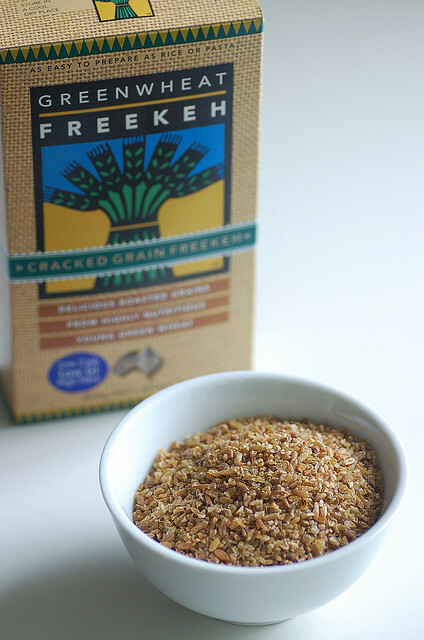 Freekeh only just visible under all of the loveliness. I haven’t tried cooking this yet but ate it as part of the best blinking salad I ever did eat in my life during a trip to Copehagen with the Flatmate in August 2014. Health benefits are much-touted but probably no better or worse than other grains and it’s still rather expensive (“ancient grains” often come with a price tag I’d associate with antiques but it does rather take the piss). But definitely one to do sometime. trend-o-meter – 5/5 (yummy, delicious grain. It’s justified and it’s ancient – little KLF reference for you there).